It’s 11 pm on any given night in our house. My alarm will go off at 7 am, so I believe there’s more than enough time for me to get an adequate night’s sleep. I put on my comfy pajamas, kiss my kids goodnight and tell my dog I’ll see her in the morning. The exact moment I lay my head on my pillow, there’s a bit of a problem and the battle begins. My mind starts racing and all of a sudden I’m instantly thinking of things to put on my to-do list for the next day. How do doctors do it? I’ve always wondered if there’s a class in medical school that advises them on what to say when they have deliver a questionable or bad diagnosis? How are nurses and other medical professionals able to keep doing their jobs with kindness and grace when they see the chart and they know you’ve just been hit by a blow. A blow that in many cases, you had no ideas was coming your way? January 2013 was life-changing for me. A routine trip to the chiropractor led to some concerns. Those concerns led to some tests. The inconclusive results of those tests led to more specialized tests. And the specialized test results led me to the office of a surgical oncologist. All of this occurred in about 10 days. It was a whirlwind. After that initial diagnosis, I then had to undergo therapies and treatments while waiting for a surgery that would happen six months later. According to the American Cancer Society, an estimated 1.6 million people were diagnosed with cancer between 1998 and 2012. About 64,000 of those diagnoses were for thyroid cancer, with women outnumbering men in having the disease at overwhelming statistics. The survival rates for thyroid cancer in particular are 97 percent. But the numbers are not that optimistic for other cancers. An NBC News report noted that the 10 most deadliest cancers are 1. Lung and Bronchial Cancer, 2. Colon and Rectal Cancer, 3. Breast Cancer, 4. Pancreatic Cancer, 5. Prostate Cancer, 6. Leukemia, 7. Non-Hodgkin Lymphoma, 8. Liver Cancer, 9. Ovarian Cancer, and 10. Esophageal Cancer. One of my college classmates who is now a doctor recently updated his Facebook status to remind us that there is a lot each and every one of us can do to protect the precious lives that we have been given. And this advice y’all, he says is pertinent to anyone older than 35. Anyone. Ouch. Sitting is the new smoking. We should not be sitting still more than 3 hours a day. We should be going for more walks, choosing to take the stairs, parking in one of the last spaces in the parking lot and walking. All of this is in addition to our daily exercise of zumba, cross fit, or whatever our cardio hearts desire. Only take antibiotics when absolutely necessary, and most definitely only when prescribed by a doctor. According to the website for the Mayo Clinic, antibiotics have been proven to impede the natural work of our digestive tracts. If you’ve taken antibiotics, you undoubtedly know that diarrhea is a side effect. This happens because antibacterial medications tend to upset the balance of good and bad bacteria in your gut. Only take them when needed. Physical Exercise is a must. Regularly. Like every day. As much as possible. We take care of our bodies by what we put in it. Stop eating crap. Period. Cognitive Training is a plus. As we age, we should exercising our brains. The official term is neuroplasticity or something like that, but here’s the bottom line. Start up a new game of Words With Friends, keep playing Candy Crush Saga, and host occasional game nights with family and friends. It’s all good! In other words, as adults our charge is two-fold. Now is the time for us to be doing the things that we should have been doing all along. And as parents, it is critical for our children to learn how to take care of themselves properly. And what’s really interesting is that when I had cancer, I felt much better when I ate the right foods. I know I am not a medical professional, I am an avid reader. I’m sharing this information from credible sources and my own opinion based on my medical diagnosis. This should not in any way replace the advice of your own doctor. While I don’t do anything to officially commemorate the month of January as my cancer diagnosis month, (I prefer all commemoration happen in June, the month I was actually deemed cancer free) I do use the month to reflect on how that diagnosis three years ago has changed my life. I have finally realized that to my parents, I am and will always be their baby. My parents did a fine job of raising me to be a very independent person. I am an only child and even though I am in my 40s, I have found that no matter where I go, or what I do, I am always their baby. And for the record, my kids are a very thin extension of that. All four of us are their babies. Nutrition and exercise are critical to good health. I know I wrote that above, but it’s amazing when you come to the revelation on your own. Be a family that talks about things. Talk about family medical history, talk about how you are feeling, talk about it all. Talking about things regularly before a crisis occurs sets the foundation for how you and your family will cope when the going gets rough. Life after cancer does not return to normal, life after cancer is the new normal. The sooner I could accept that, the better off I was. My cancer-free life consists of bi-monthly doctor visits, medicine every day for the rest of my life and sometime painful side effects of not having a thyroid. It’s sometimes the smallest things that have the biggest impact in our bodies. I’m still amazed at how a small glad that is shaped like a butterfly has such a profound impact on the body. Second opinions are okay. They are more than okay, they are necessary. Get as much information as you need and take the amount of time that you need so you can make the decision that best for you. Every day, do something you absolutely love. A happy heart is a healthy heart. When your mind, body, and spirit are aligned, your chances for illness are lessened greatly. Doing more of what you love equals less stress. Less stress equals lower blood pressure, a stronger immune system, and no more obscure aches and pains. Offer to go to doctor’s appointments with them and take notes. Coordinate a Meal Train for them from diagnosis to recovery. Say a special prayer for them each morning and each night. Give them the time they need to process what’s happening to them. Don’t bombard them with questions, and don’t get mad if it takes them some time to open up to you. As a patient. I felt like I was in an episode of Grey’s Anatomy. And finally, if you ever have to deliver the news to friends and loved one about your own health diagnosis, these are the lessons I learned from my experience. 2. Give them a moment to respond in the way they are comfortable. I usually end up saying something like, “See I told you it was crazy.” Telling someone you have cancer is 10 percent about you, but 90 percent about them. They will instantly remember their uncle, or cousin or friend who has had the disease and no matter what your prognosis is, their mind will travel. 4. Tell them how you will keep them informed. Once people get over the initial shock, they need to know how they will keep up with your progress. Tell them they’ll see you at work until surgery, they can read your blog on Caring Bridge, or that a certain family member will keep them updated. If you don’t have a plan to keep them informed, they will stalk you and pressure you and make your life more miserable than cancer already is. 5. Let people see you “live” with the disease. I know that with any medical condition, you have good days and you have bad days. Some days, I remember wishing I could say, “I have cancer so I’m staying in bed all day.” But I couldn’t. My kids were in 4th, 5th, and 6th grades at the time of my diagnosis. There were tonsils that had to be removed, middle school hormones, and a Presidential Inauguration that we had to attend. Continuing to “live” is just as important for me as it for everyone around me. During my cancer experience, I made sure that others (especially my children) would see me actually living with the disease. Our trip to the Presidential Inauguration was an example of that. While my diagnosis was scary and I was fortunate enough to have a great prognosis and an ever greater outcome, that cancer event led me to be even more appreciative of the life I have instead of trying unsuccessfully to force the life I thought I should have. About three weeks ago, I needed to get a refill but the doctor recommended that I come in for an appointment first. This past spring, I had a super crazy sinus infection that somehow affected my eyesight for about a week. I was seeing double, y’all.So he wanted to follow up with me on my sinus issues and talk about my low vitamin d levels, which have been a problem for the past 6 months or so also. So in a very happy-go-lucky routine trip to the doctor, I was ready to skip away with my new prescription, a discussion about sinus infections and seasonal allergies, and a quick update on the kids and how they’ve grown. He’s our family doctor, and has been so for 10 years, so a question about the kids is normal. But that’s not quite how it went. 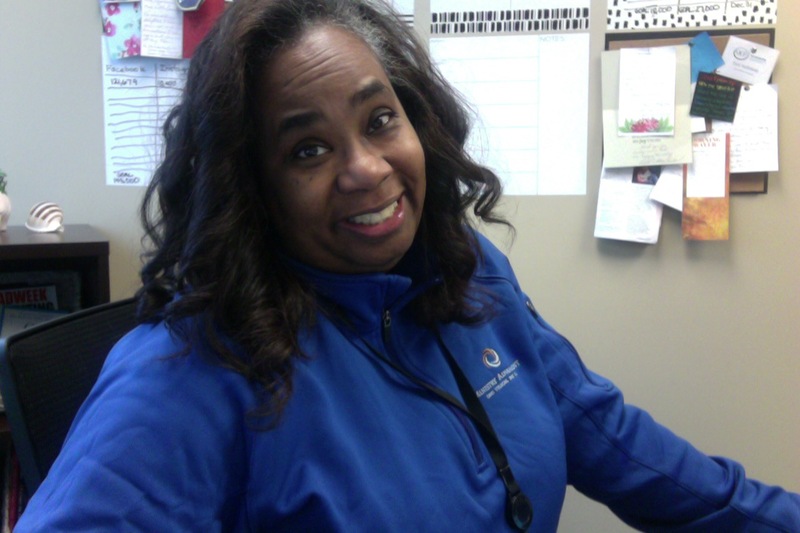 When the nurse took my blood pressure, she said, “Hmmm….I think I need to take it again.” I took a deep breath but was still not too concerned. I always tend to be on the upper limit of the normal range. “A lot? How are my thyroid levels?” After all, that was the main reason I was there. And from there, my happy little appointment with my family doctor who I love went downhill. So, without me turning this into a crazy medical post about all the things wrong with my body, I’ll share the highlights of that visit. I left with seven new prescriptions, a strict vitamin regimen, and very clear instructions regarding my eating habits. I am also taking some time of work indefinitely and no longer drinking caffeine. So, like any good (and scared) patient would do, I got the prescriptions filled and start googling blood levels and medicines and interactions. Y’all, I discovered something. Some of this is a result of my thyroid disease. But the dreadful truth is that most of this could have been prevented. The stress plays a part, nutrition plays a part, sunlight plays a part. And the fact that it all snuck up on me in two months is even scarier. And I’m now doing what I should have been doing all along — sitting down — at the house. For those of you who know me well or if you’ve been reading this blog for a while, you know that August is probably one of the busiest months of the year at my full-time job. And I feel bad, because I have co-workers who I love and miss. But the reality is, my body needed this. I’m also taking this time to rest (the meds make me sleepy), create fun end-of-summer memories with my kids, catching up with old friends over more than text messages, and reading. Which I’ve found in the past three weeks, is what really matters when it’s all said and done. Thank you family doctor who I still love so much. You helped me see what really matters. Even if it is disguised in a low-carb lifestyle with no caffeine. 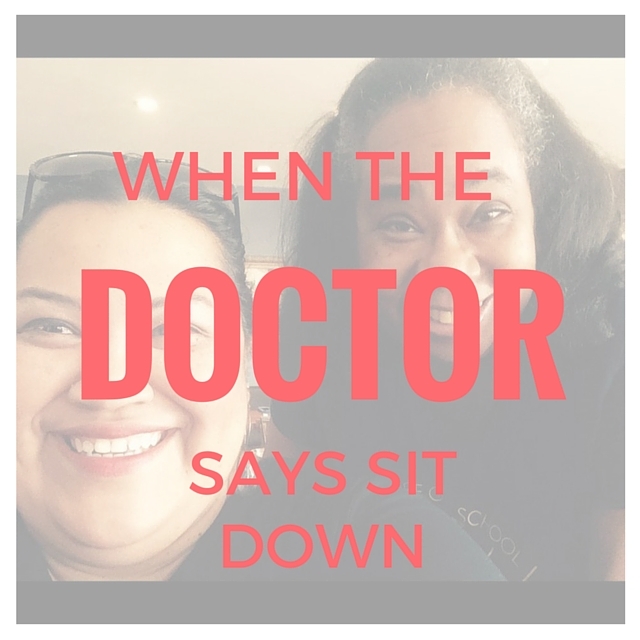 Has the doctor ever told you to sit down? Did you? I’ve probably thought of no less than 20 ways to write this post, and when I started writing, it all boils down to this. I AM CANCER FREE. The pathologist’s report found that the cancerous cells were in the large tumor and no where else. My lymph nodes were clear, everything was clear and I am happy to be rid of it. As what’s typical to any writer who undergoes a pretty serious issue of any kind, I’ve thought of what this now means, what we can now do, what I have learned from this…all of it. And I will write about it…one day. But for now, I don’t have to..and the only words I feel like writing are I AM CANCER FREE.